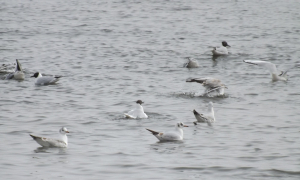 Observation - Black-headed Gulls - UK and Ireland. Description: Flock of about 30 BHGs, some in summer headwear and some still in winter garb, seen on River Taff, during Gwyl Taf nature walk. Flock of about 30 BHGs, some in summer headwear and some still in winter garb, seen on River Taff, during Gwyl Taf nature walk.